"...the worst in decades..." uttered the current PM, Yingluck Shinawatra. Flood is one of the worst natural disasters that submerges land. Those who have never encountered with flood before can never grasp the idea of how severe it can be. My first encounter with big flood was when I was 5 years old and our house back then was just next to a small stream. As far as I can recall, rain didn't stop that day and my parents were at work. The ones who were left at home at that time were my Nini (grandmother), my brother and I. Of course our house was elevated several feet to the tiny Kionsom stream but as I said, the rain didn't stop that day and what I didn't know to be flash flood at that time suddenly gushed out from way up stream. That moment, Nini must have noticed the current was strong enough to wash all the small trees that grew along the river bank, she ran passed the kitchen to the semi-detached bathroom to look at the metal fences that surrounded our house and was suppose to defend our bathroom from being touch by the river water. The rain was loud and I could see my 3 year old brother was already in his boots, holding a stick, enjoying the rain and chasing after my Nini, who at that time panicked since the flood water was rising. To mitigate her worries, she tried catching our floating tampui (baby potties) and used it to drain away water that began to cross over the fence. I was silently praying that mom and dad would come home fast but not until later got to know that they were stuck on their way home because of a big tree that fell and was blocking the road home. Perhaps, to think over it now, it was impossible for them to cross the two one way bridges that led home anyway because of the flood! While trying to get rid of the excess water, I caught glimpses of Nini chanting her prayers and kept doing the tanda salib (the sign of the cross) in hope that the rain would stop and flood won't enter our house. When she saw brother and I happily playing sword fights with our sticks, she grabbed us, put us on comfy clothes and ran to our closest neighbor who lived 150meters from the river. There, Nini found comfort and was relieved by having several adults to empathized with her fears. This familiarity just showed me now, how much she worried and sacrificed for us. 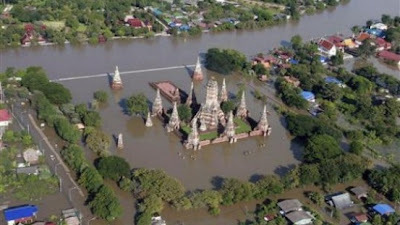 I guess if I couldn't recall any other flood experiences other than the above, this expected Thailand mega flood will be the next one. Many nearby provinces such as Ayutthaya, Nakhon Sawan and Nonthaburi have been or still on the verge of evacuating residents to safer grounds. 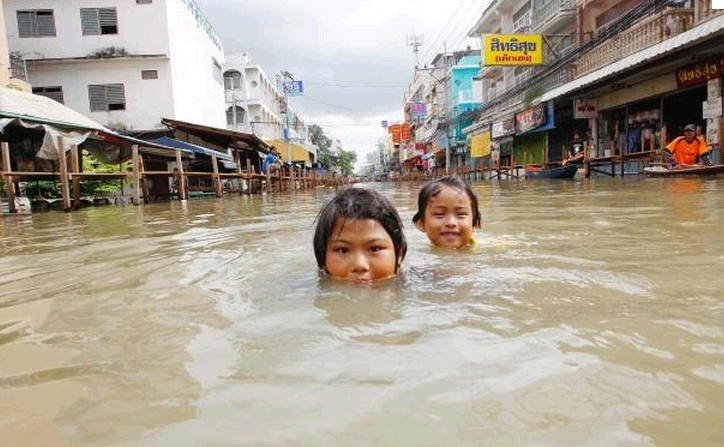 Bangkok residents have also received warnings to stay alert of unusual incoming flood water for the next few days. So far, many automobile galleries have moved their cars elsewhere, banks have stacked piles of sandbags and schools have prepared themselves just in case they will open as temporary shelters. Most of the supermarkets I visited yesterday were out of rice, vegetables, water and instant noodles! Hobbit and I were glad to be able to shop earlier. In school, nescient of their actions and thoughts, most of my students are praying that flood will take over our school for the next few days. Little did they know that flood ain't just flood, calamity and adversity come with it too! One main reason for what they are wishing for is that this week is our final week for the quarter. Therefore, they are anticipating tests from most of their subjects. Yet some of them who have families lost their homes, Black diamond earrings and other possessions were able to identify with the nation's major stress. I hope nothing turns bad despite of some superstitious belief that this year is a punishment year for Thailand because of all the delinquent sins. I totally choose to debunk the thought because I still believe that God's forgiveness prevails to those who love Him.